The season of giving is nearing and when you have done your Christmas preparations, the next thing to do would be to get yourself ready for Christmas. This is the season where a lot of things are happening at the same time. Being the most awaited occasion all year long, a lot of things are being planned such as parties, dinners, get together with acquaintances and meet ups with old friends. This is why you ought to prepare your nails if you want it to go with the Christmas theme and match your Christmas outfits as well. However you are not sure what type of Christmas nail art to put on your nails, or how you can paint them on. What you need to remember is that red and green is the classic Christmas color, but you can always deviate from the norm, with being a bit creative of course. The grand thing about experimenting with other colors for Christmas is that it makes your nail art unique and a total stand out. Don’t be afraid to experiment though, you should also be careful of not overdoing it lest your nails become a fashion disaster. Now you ask yourself: how do I start with painting my Christmas nails? 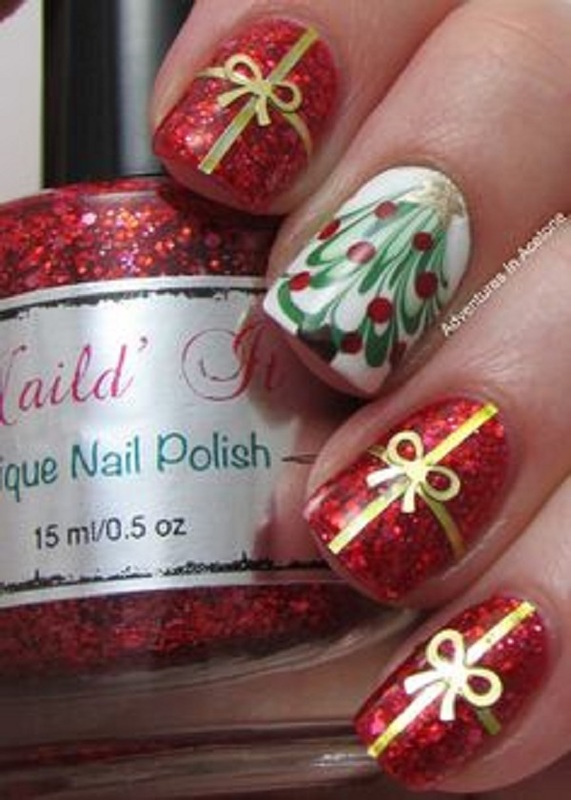 Below is an example of a design that you can try out for a start for your Christmas nail art project. What’s the best representation of Christmas that you can paint? A good old Christmas tree of course. Try to recreate a cute Christmas tree nail art as well as adding other cute designs on your nails for variety. Start by painting on a clear base coat. The base coat is what protects your nails from being damaged from the layers of nail polish on top of it. Most base colors are white but you can also use a clear coat for this one. Choose two colors of polishes that you can paint alternately on your nails. The good thing about alternate painting is that it makes your nails look more interesting and adds more attitude to the nail art. You can choose from red and white, red and green or even blue and white. The white coated nails will be the canvas for your Christmas tree. After applying the colors make sure that they are dry first before applying another layer. For the next step get a green polish that will serve as the body of your Christmas tree. Simply dip the brush inside and create dotted lines that form a triangle. You can start by placing three dotted lines on the bottom, two above it then one on top thus creating a Christmas tree shape. You can use the regular polish brush for the dots, however if you find the brush hard to use you can always go for the special smaller brushes that are made for tiny designs like these. On the other hand you can also be practical and go for toothpicks which can also do the same wonders. After painting on the tree you can paint other designs on the colored part of the nails. Draw stripes or diagonal lines using the toothpick or small brush for more precision. You can then add more dots to your Christmas tree for example try putting on red dots to signify Christmas balls and a yellow dot on top of the tree for the star. Unless you have a really thin and fine brush to use, you can draw the star in detail, but if you don’t this will be very challenging but dipping the brush to form a circle is also acceptable. You can then add more designs to your nail art by using glitter polish for the stencil effect. You can even opt for the metallic polish to make more details on your Christmas tree. Using the clear coat, apply it on the very top of the layers. Make sure that all the polish has dried before applying the top coat. If you could, wait at least ten minutes for the polish to completely dry off before applying the clear coat on top. 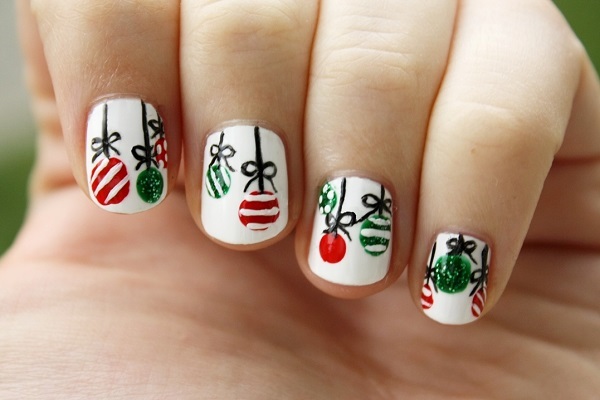 After that you now have your own Christmas themed nail art design! Of course there are plenty more interesting designs that you can use as reference or get motivation from. 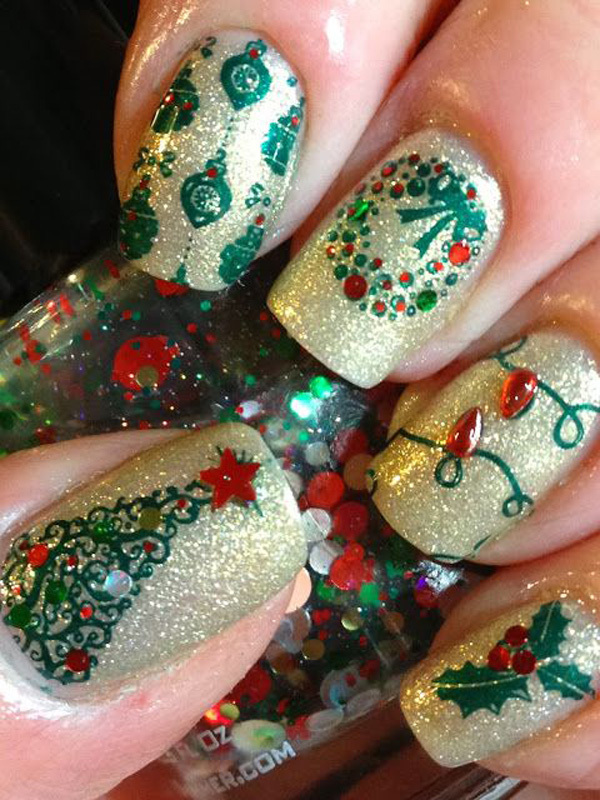 You can always search online for images of Christmas nail art designs that you wish to recreate. The key to perfecting nail art is practice. You can never say that one design is too difficult because you can always try it and see for yourself. Even though you can’t get the exact patterns on the first try, just try again. If you want to have an almost subtle Christmas nail art then you can always go for the color combinations that are normal yet fitting towards the festive occasion. You can also go for simpler designs such as French tips or plaid designs which also work for any type of occasion. The important thing is you can find the perfect Christmas nail art design that you are looking for and that you can recreate it on your own nails just in time for the Christmas celebration. 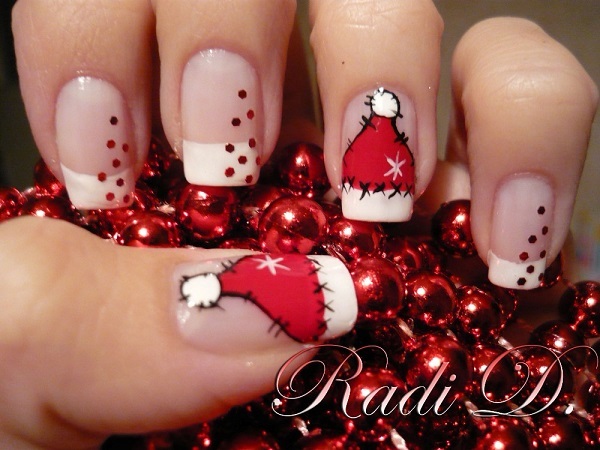 Check out this wonderful Santa hat nail art. 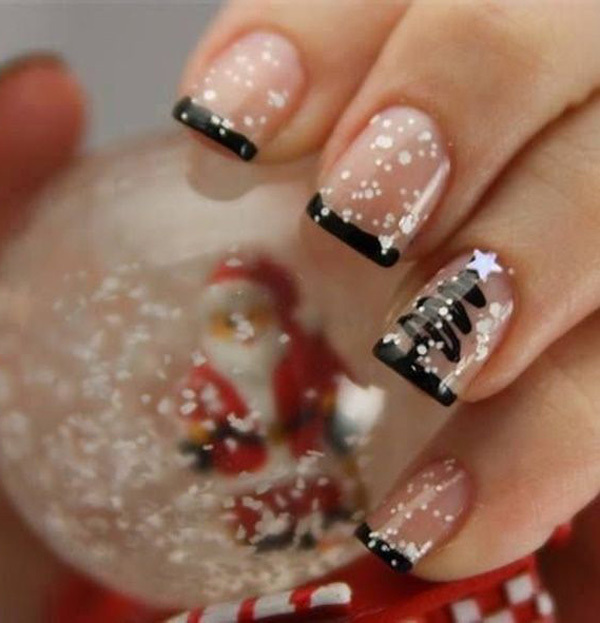 Be creative and paint on Santa hat French tips on your nails with stencil embellishments as cascading Christmas balls. Snowman inspired Christmas nail art. 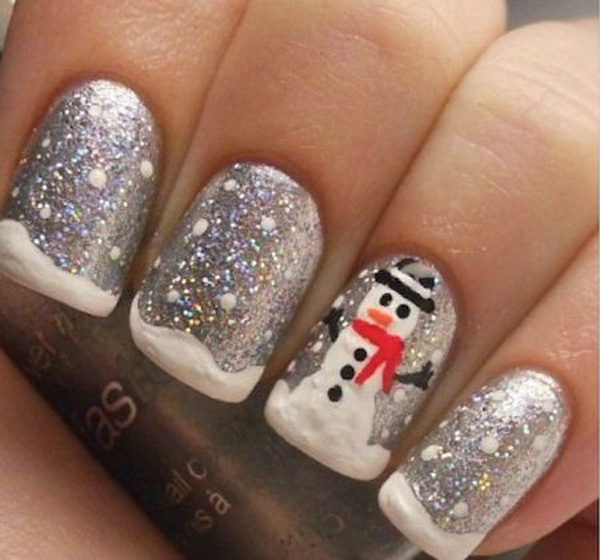 Recreate the snowman and the snow with this nail art reference. Make use of a combination of nail polish and glitter polish for that sparkling effect. 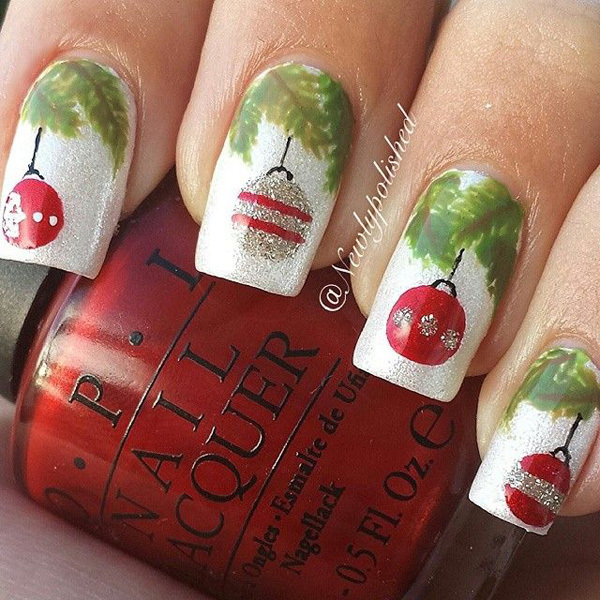 Take a peek at this very creative and classy Christmas nail art. Use a matte red color to fill the nails and add fur embellishments as French tips. Simple yet very eye catching design. A bright blue colored Christmas nail art. Fill your nails with beautiful snowflakes with this gradient blue and silver metallic polish designs. Very elegant and very pretty to look at. Adorable and cute reindeer inspired Christmas art. 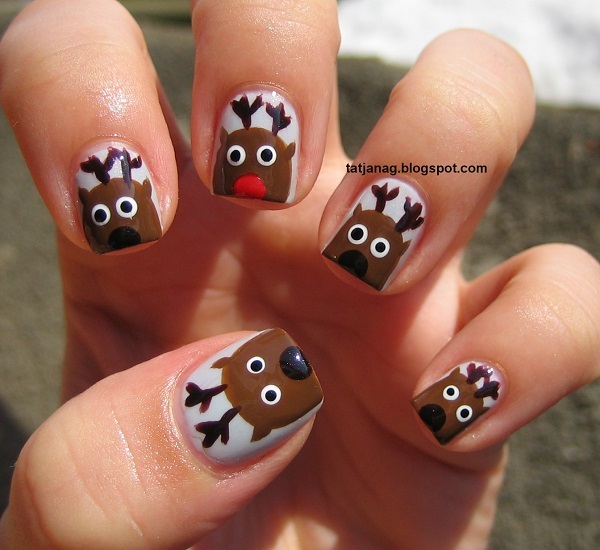 Draw various reindeers on your nails with huge cute eyes and a red nose for Rudolph. 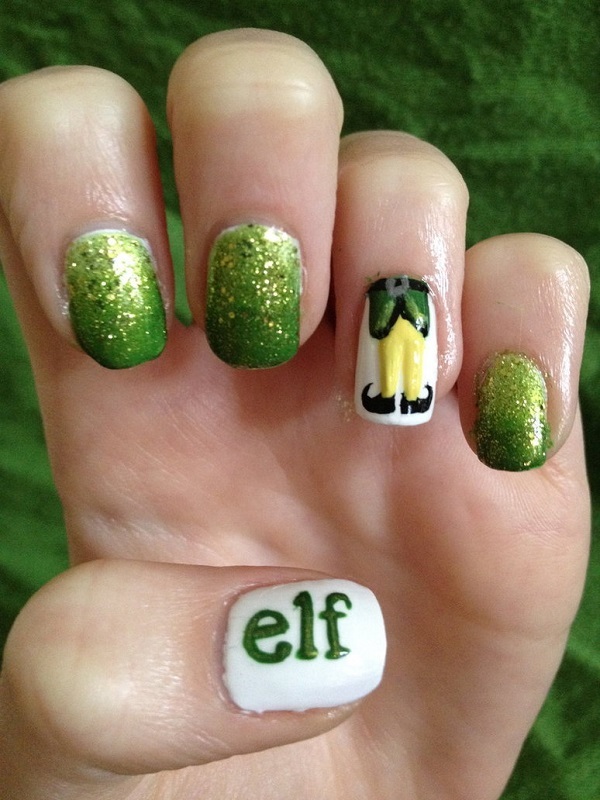 Elf inspired Christmas nail art. This wonderful looking gradient nail art using glitter polish. For more effect you can add a drawing of elf feet and the word elf to emphasize the character. 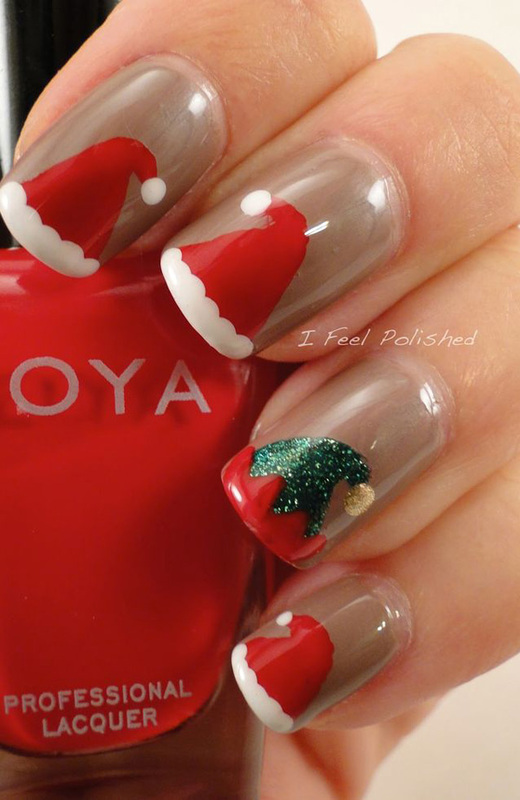 Very cute Santa nail art. 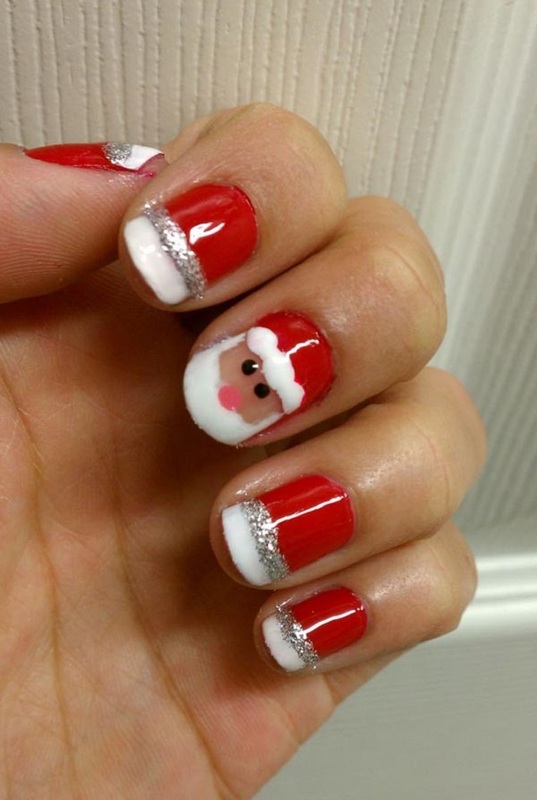 Paint an adorable Santa head amidst the Santa hats in your nails. You can use silver glitter for the lining of the hats. 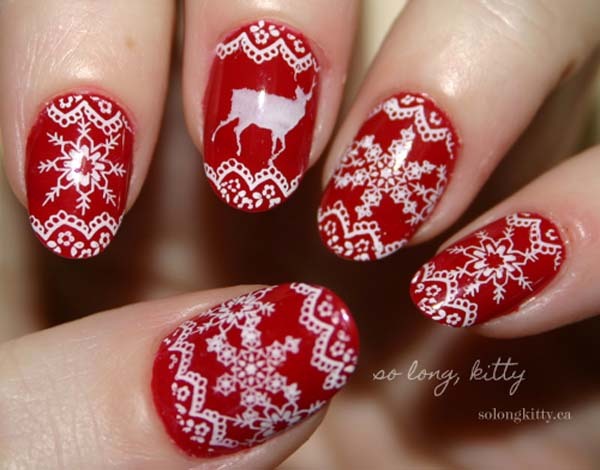 Really pretty snowflakes and reindeer Christmas nail art. Give tribute to silhouettes and glorious looking snowflakes with this nail art reference. 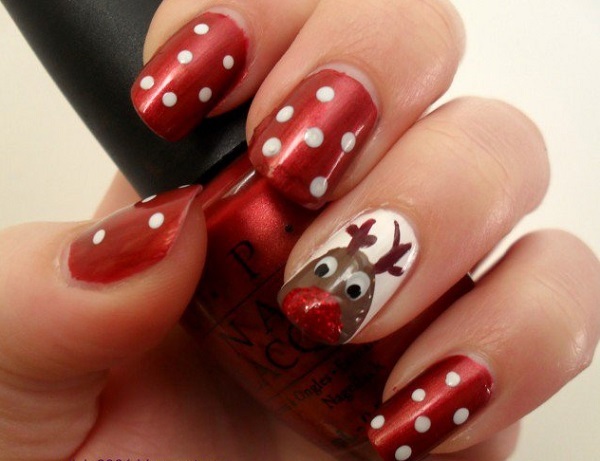 Add a dose of cute to your nail art with these amazing Christmas nail art. Drop in a tomato just for laughs and make your nails truly stand out this Christmas season. 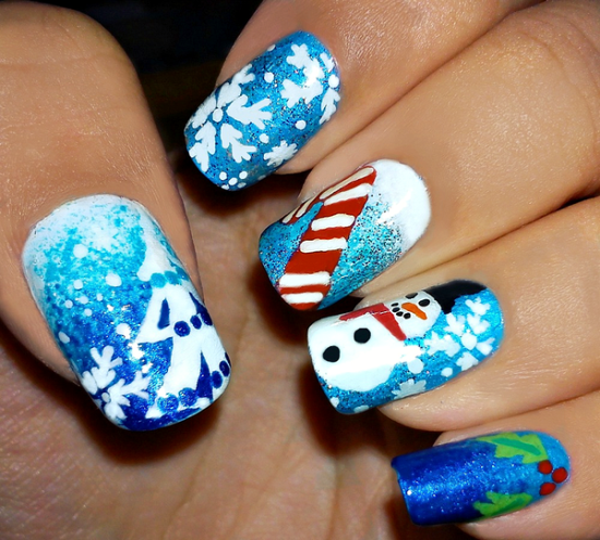 Snowman inspired nail art. White is the key polish in this design along with black for the details and orange for the nose. A very simple and pretty nail art design. Glitter and belt themed Christmas nail art. Paint on bright red nail polish and add gold glitter as the French tip. For a cuter effect add belt details close to the tip of the nails in black and gold polish. Christmas nail art starring the snowman, a candy cane and mistletoe. 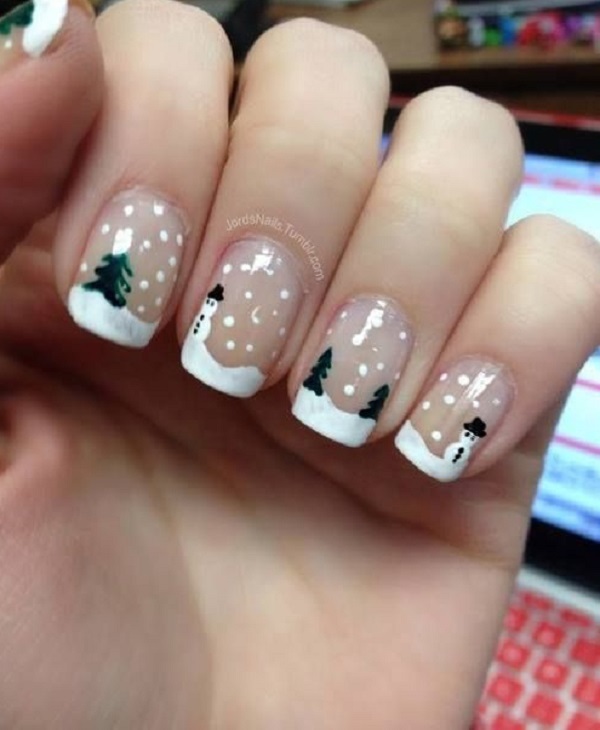 A perfect nail art to go with this festive season and very adorable to look at as well. A bedazzled red, gold and silver themed Christmas nail art. Sparkling is in the house which is why donning this nail art in glitter polish, beads and more embellishments makes it even more stunning to look at. Ribbon Christmas inspired French tip. 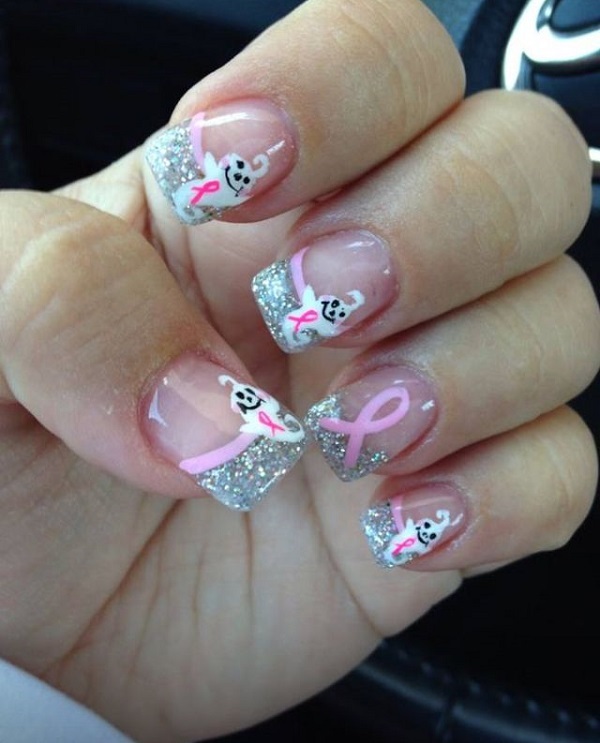 Give some love to your French tip by adding silver glitter to the tips and capping them off with a cute pink ribbon. To make the nail art cuter you can draw adorable little white pixies on top. Classy and elegant looking red themed Christmas nail art. Design your nails with Christmas ribbons and bells in glitter polish. Not only does it look beautiful but it gives an elegant feel to your nails. Simple yet pretty Christmas nail art. 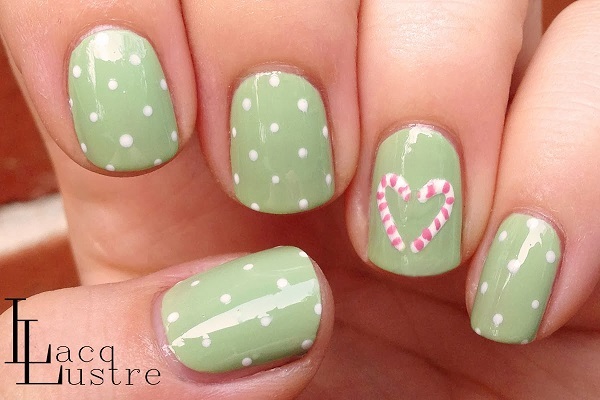 Design your nails in green polish topped with white polka dot polishes and candy cane details. 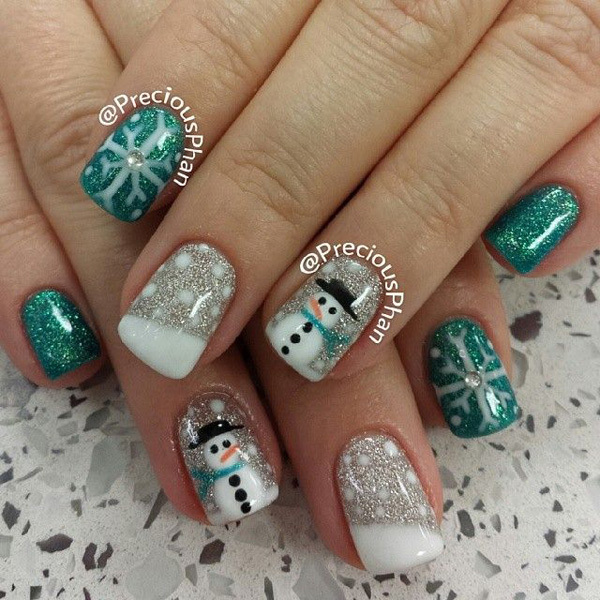 Serene looking “snowman by the mountain” themed Christmas nail art. Using a clear base coat, you can then add details on top such as a snowy mountain, trees filled with snow as well as a single snowman for effect. Paint your nails bloody red with gold with this Christmas nail art design. Paint on matte red polish on your nails. Then add details of Christmas trees on the mountains. A real simple but eye catching design. A perfect and Christmas ready nail art design. 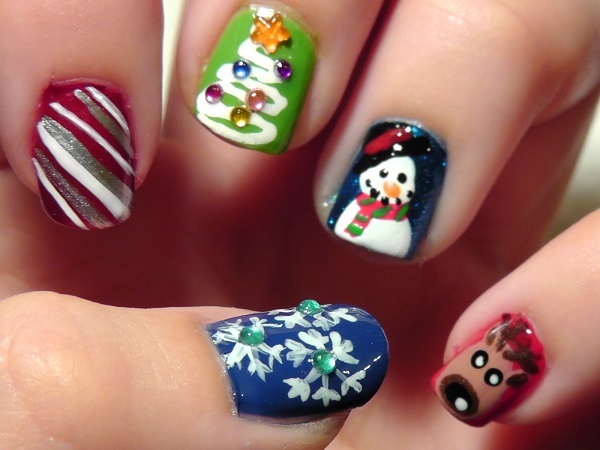 Paint on various details of Christmas sweater designs on your nails. Use glitter polish to make them stand out and cover with base coat afterwards. A green and white inspired nail art. Draw in your favorite snowman designs as well as snowflakes and paint on adorable snowman on your nails. Very cute and easy to make. A perfect Christmas snowman for a perfect Christmas art. Get to draw a cute snowman on your nails using white and black polish. Draw on images falling snowflakes for effect. Gold and white themed Christmas nail art. Bring in the white and gold colors. Use glitter polish for the gold and white polish for the rest of the design. It looks beautiful and elegant at the same time. Christmas French tips. Draw the holiday season on your French tips with red and silver glitter polish at the tips, lined with white polish. You can also draw different colored ribbons as well as snowflakes on top. 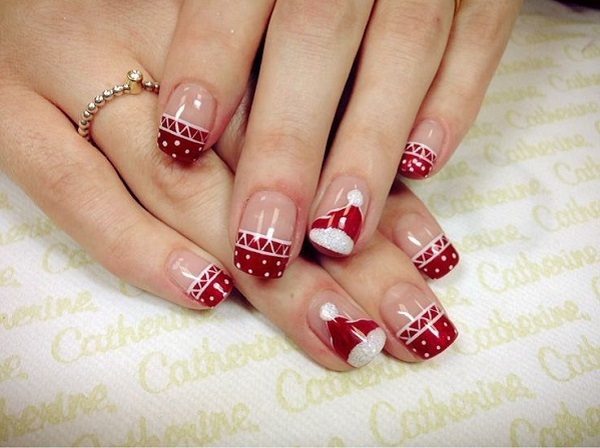 Red and white Christmas nail art theme. 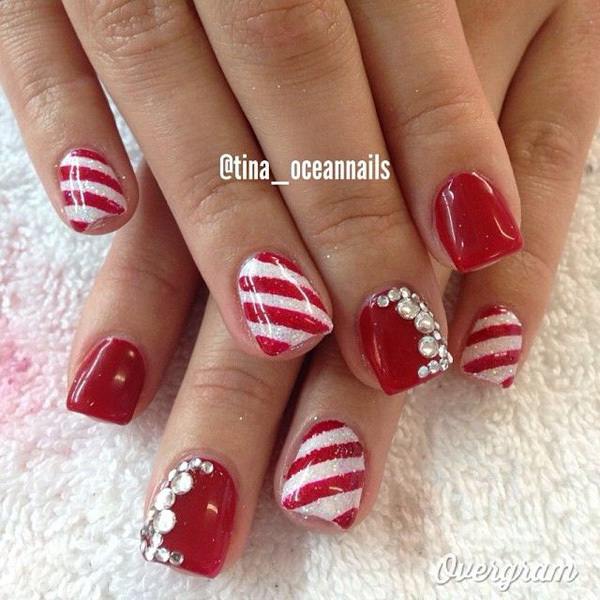 Make your nails your very own candy cane with the red and white striped combination. Add embellishments on top for more effect. Silver Christmas French tips with snowflakes. Let the snow rain in on your nails by drawing them over your perfect silver glitter French tips. Check out this red and white polka dot Christmas nail art. This cute design is done in red base color with white polka dots on top. A cute Rudolph the red nosed reindeer is then drawn to one of the nails for effect. 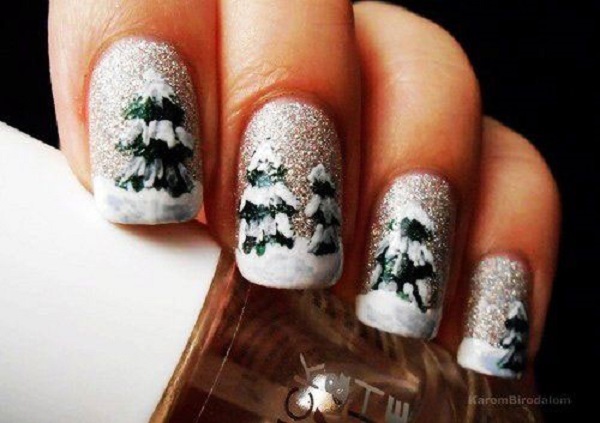 A snowy Christmas nail art you will absolutely adore. 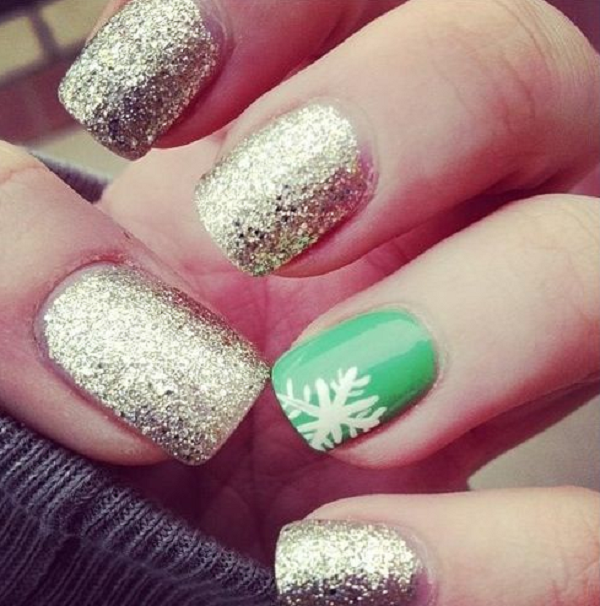 Use white, silver and green polishes to complete the nail art depicting a mountain in snow with Christmas trees. 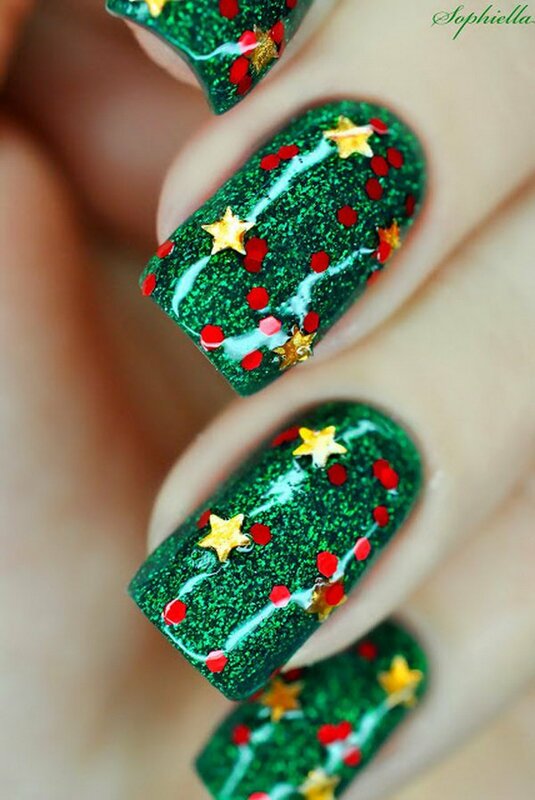 Very cute Christmas tree inspired nail art. 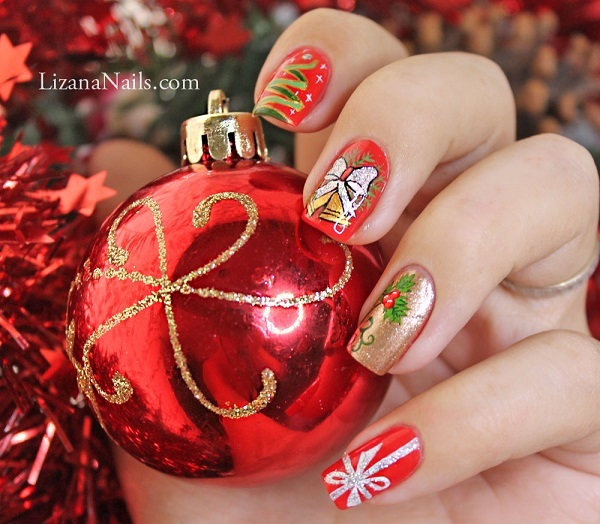 Paint Christmas decorations on your nails assuming the inner part is the Christmas tree branch. It looks fun and interesting to create. 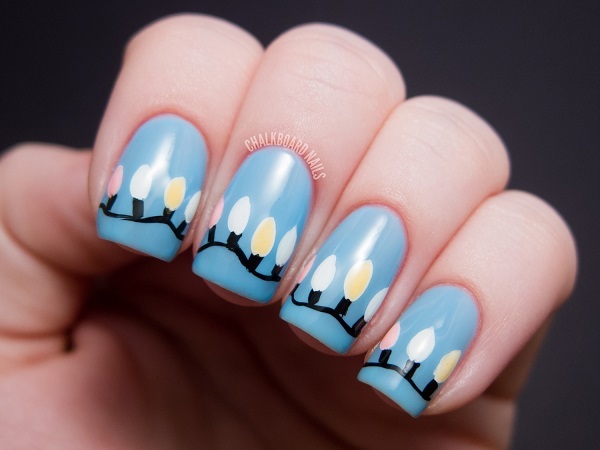 Christmas bulbs inspired nail art. Paint colorful Christmas bulbs on your nails for this Christmas season. Use pastel colors to get that soft effect. Adorable Christmas themed French tip. Paint your nails in clear coat as base and add white polish on top for the French tips and falling snowflakes. 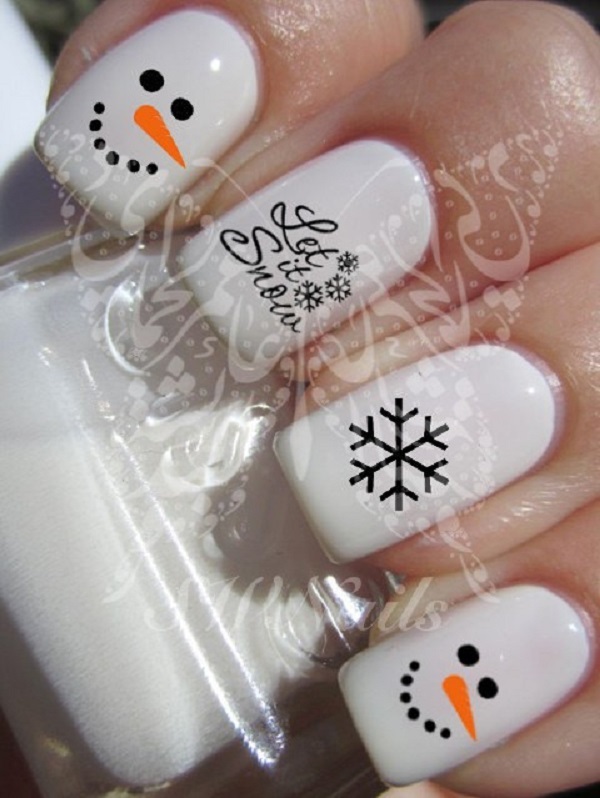 Add more accent to your nails by drawing a snowman ad penguin on top. Insert randomness into your Christmas art with these various characters. 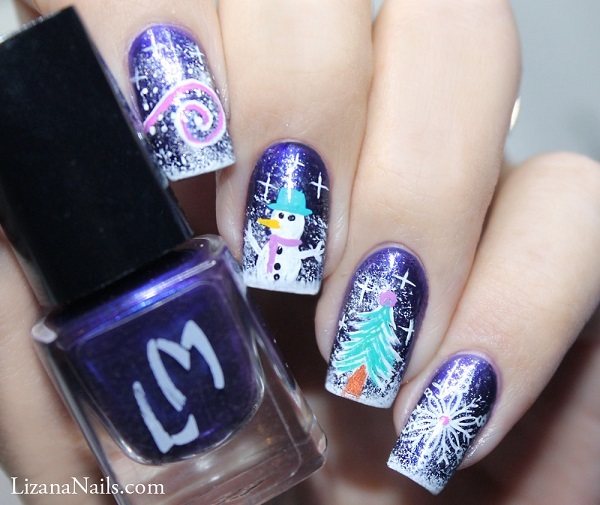 Color your nails in different nail polish colors and add characters on top such as a snowman and reindeer. You can also add Christmas trees, snowflakes and candy canes. Green and silver themed Christmas nail art. Paint matte green and silver glitter on your nails. Add a snowflake in white polish for accent. White and silver themed Christmas nail art. Be creative and combine white and gray glitter colors on your nails. Add simple details like snowflakes, polka dots and a snowman to make it stand out more. 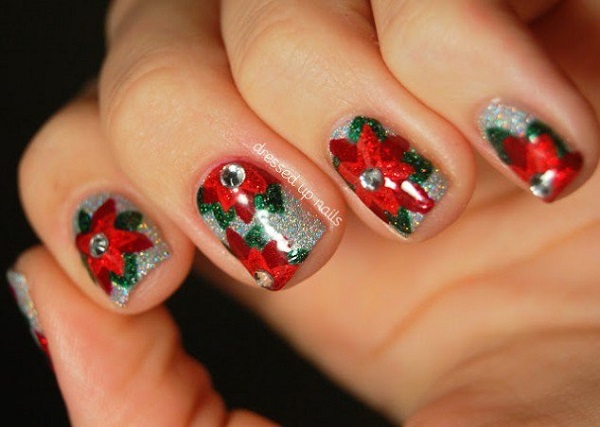 Poinsettia themed Christmas nail art. Fill your nail with silver glitter paint and draw pretty poinsettia flowers on top. Add beads to enhance the accent. 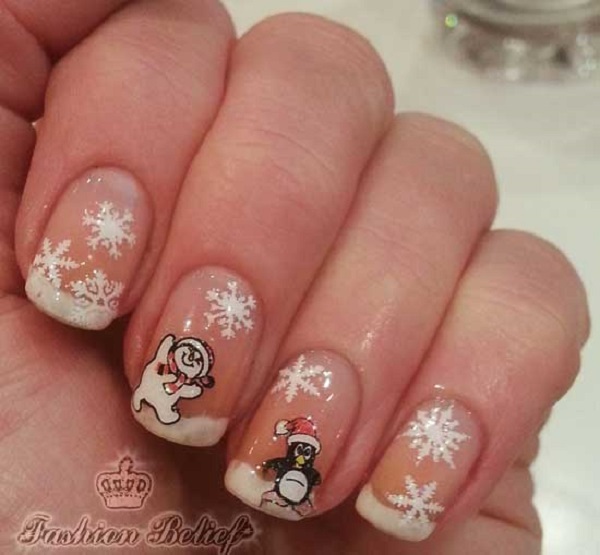 A very cute and adorable Christmas nail art just for you. Paint your nails in dark and light green polish and add colorful polka dots with Christmas tree silhouettes on other nails. Check out this continuous Santa on the nails. This is a perfect nail art design when you want to be different from those regular nail art designs. A simple yet very pretty Christmas nail art that you can follow. Using clear base coat the nails are then topped with silver glitter as well as green and red stencils for effect. Creative and artsy looking French tips in red that you should try out. Paint Christmas hats and polka dots on your nail as French tips. The white and red combination is simply perfect for this style. Penguin and polka dot inspired Christmas nail art. Fill your nails in silver glitter polish and add random colors of polka dots on top with a penguin character donning a cute Santa hat. Go for an elegant Christmas nail art design like this. 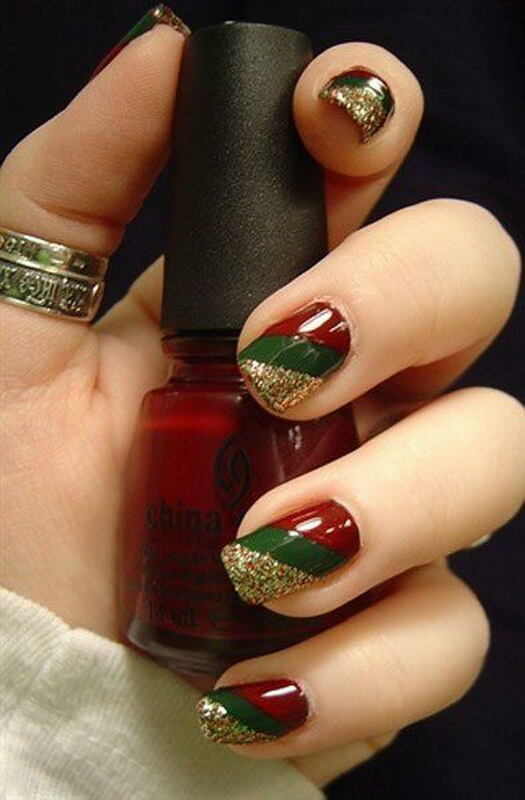 Using deep red and green polish and adding gold glitter to the tips can easily turn your nails into something really classy. Nail polish and sequins Christmas nail art combination. By filling your nails with a black polish background the colorful sequins you place on top is given more highlight and you can even use a variety colors for effect. Do you like Frozen inspired nail art? Check out this Olaf themed nail art that you can do for this Christmas season. Paint Olaf enjoying his very first summer in this wonderful looking design. 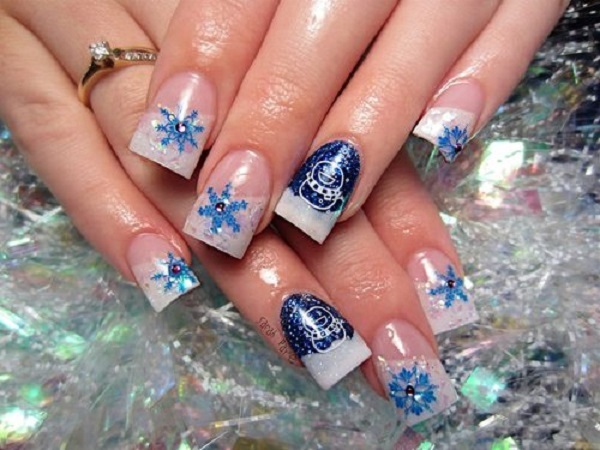 Paint wonderful snow landscapes on your nails with this Christmas nail art design. Use clear coat as your base and add Christmas trees in the background, falling snow and of course, don’t forget to add an adorable snowman. Delicious looking candy cane Christmas French tips. 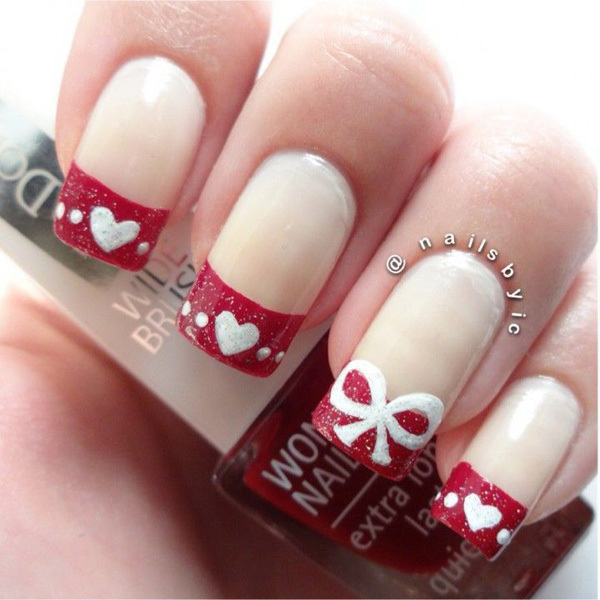 Paint on red and white polishes on your nails with adorable candy canes on top. You can also add glitter nail polish to heighten the effect of the French tips. The Grinch inspired Christmas nail art design. If you love the movie so much why not indulge in this well detailed Grinch nail art design? It looks absolutely perfect for the Christmas season. Glitter polish and sequins Christmas nail art design. Fill your nails with silver glitter polish and cap it off with a sequins inspired French tip. It looks absolutely gorgeous and unique. 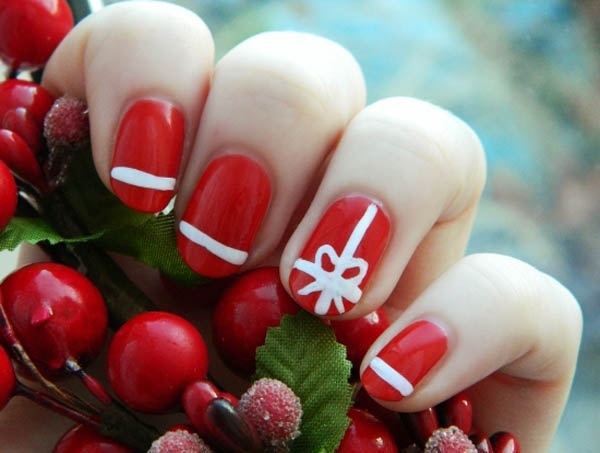 White and red laces Christmas nail art. Paint your nails in adorable lace patterns using white polish and add reindeer and snowflakes details to make the design even more attractive. 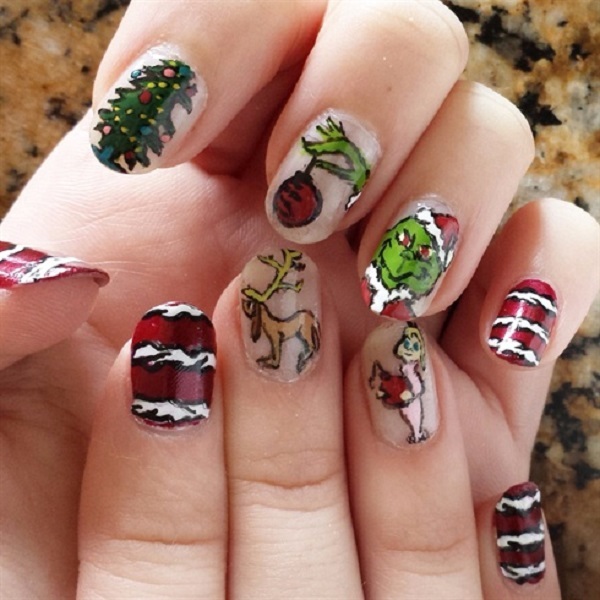 It was the night before Christmas, and that’s what this Christmas nail art is all about. Draw a serene Christmas night in the mountains with this nail polish design. Combine polishes such as green, white and yellow to create the effect. 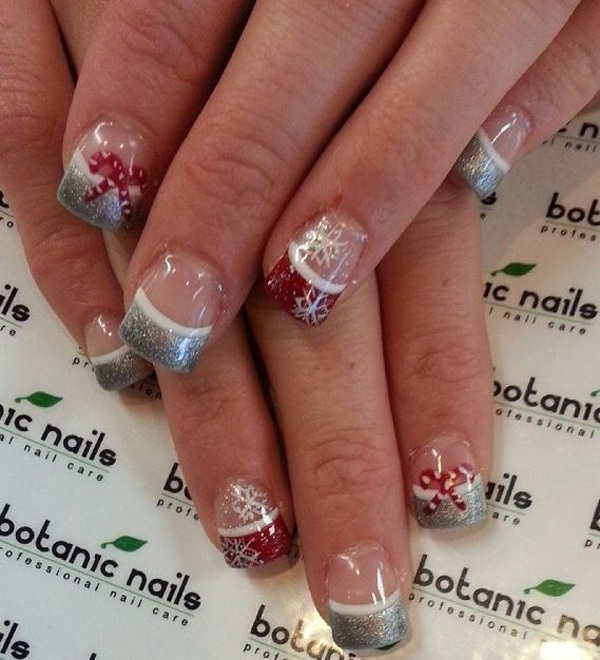 Fill your nails with this glittery red and white Christmas nail art design. 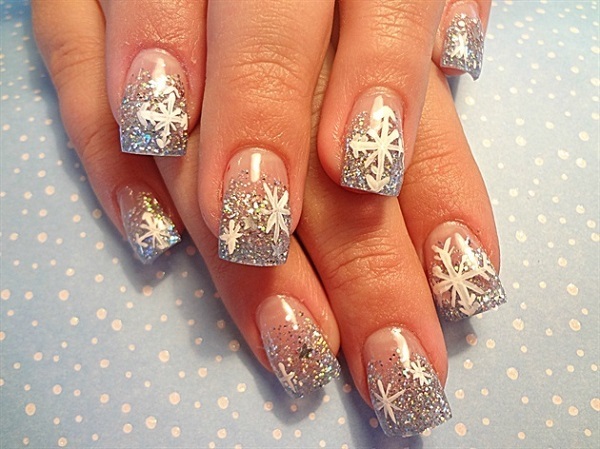 Use glitter polish for the French tips and add snowflakes falling all over the nails. A cute snowman is also a great way to cap off this design. 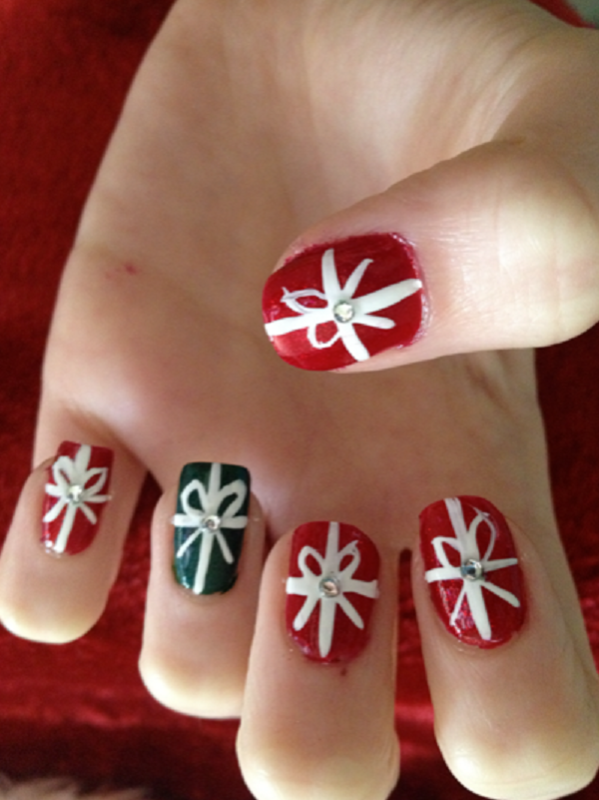 Turn your nails into Christmas gifts with this ribbon themed nail art design. You can use Christmas colors such as green and red for the wrappers and add white ribbons on top to complete the effect. Glitter themed Christmas nail art design. Paint a matte white base color on your nails and add glitter polish for the French tips. It’s very easy to recreate and quick to do. Give life to your nails with Christmas using this wonderful looking Christmas nail art. The jelly looking texture adds a treat to the colorful mixture of polishes and glitters on the nail art. Even if you have short nails you can still don a perfectly cute Christmas nail art design. Check out this Christmas balls designs where you use white polish and a combination of black, green and red polishes for the ball details. Glitter polish is also used for effect. Glittery and gorgeous looking Christmas inspired nail art. Fill up your nails in wonderful glitters of all colors and add embellishments such as beads on top as accent to the designs. If you want to go soft and subtle this Christmas then this blue themed Christmas nail art will suit you best. The baby clue colors, glitter polish, sequins and beads make a perfect combination and gives balance to the entire design. Looking for a cute Christmas French tip? This may be the design you are looking for. Use white and glitter red polish for the tips. Place accents such as glitter ribbons and hearts to give more effect to the nails. Perfect in white and blue combination. Celebrate a blue Christmas with this nail art design. Use a glitter white polish for the French tips and paint on fun looking designs topping them off with silver beads. Simple but fun looking Christmas nail art. Draw Christmas related characters such as candy canes, reindeers, Christmas, Christmas lights and so on. You can add glitter polish as well as colorful beads on top to lift up the design more. 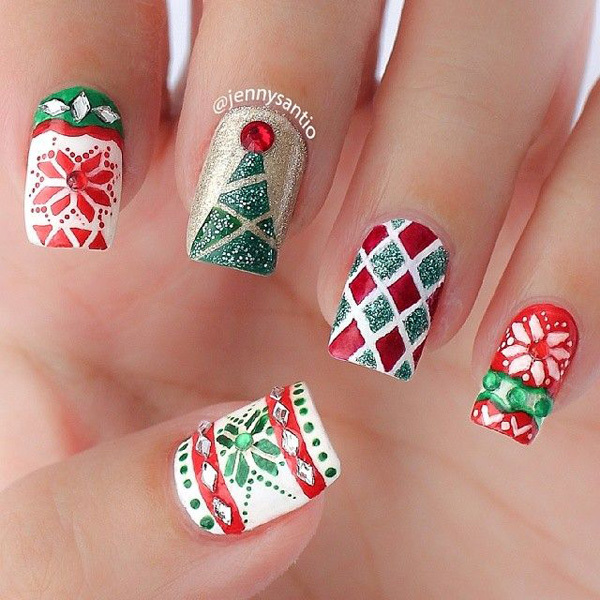 Beautiful looking Christmas nail art design. You shouldn’t be too afraid to experiment on your nails. When you can’t paint details, you can always use embellishments to fill your nails and construct a wonderful design. Christmas is in the air with this wonderful looking design. Use glitter polish as your background color and add polka dot and star shaped sequins on top to serve as the decorations. 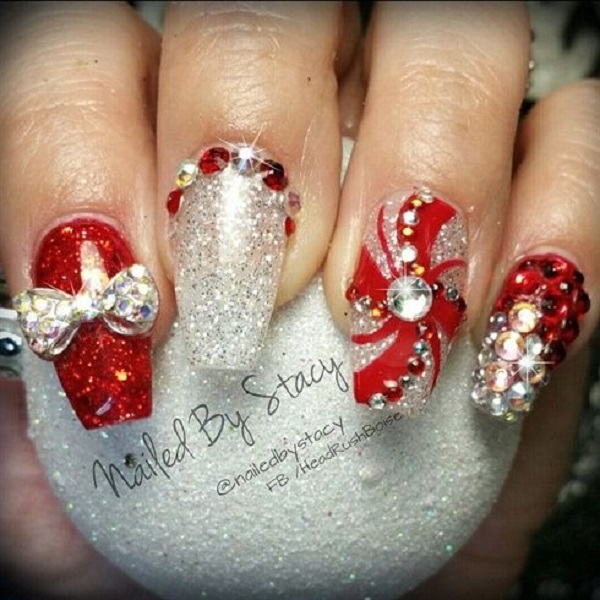 Ribbon inspired Christmas nail art design. Fill your nails with embellishments such as colorful sequins and ribbons to make it look real stunning and out there. Black and white French tips. Play around with colors this Christmas and don’t forget to add accents to your nails such as star shaped sequins to make it look even more interesting. Bright colored Christmas nail art design. Fill your nails in blue hues as you paint snowflakes, Christmas trees and a snowman on each and every fingernail. Gift wrap and Christmas tree nail art design. A perfect nail art to don on a Christmas party. Use white and red glitter polish as background and add gold ribbons on top to complete the gift effect. This is awesome. It is just what I need to know what to do with my nails for Christmas! ?